Welcome to Part 3 of our online SEO Guide for real estate investors, your one-stop-shop for all of the knowledge you need to become an SEO pro….get your site ranked for the best keywords, convert that traffic into leads, do some flips and make lots of money! In Part 1 you learned how to use the right keywords for your real estate investor website, and in Part 2 you learned how to better optimize yourwebsite’s content for user interaction. When it comes to digital marketing for your real estate investor website, a well-designed site is an important piece of the puzzle. But what good is a beautiful site if it isn’t being visited by your target audience? Even the best branding strategy and user design can’t offer much in the way of lead generation if there isn’t consistent traffic being driven its way. Remember, your real estate investor website is your business’s storefront. If you aren’t getting people to come in to your store, they won’t know what services you offer. Today, the majority of organic traffic – the kind that ends up on your site because of unpaid research results – moves about the internet via search engines. Google, Bing, and Yahoo! have completely redefined the way that visitors interact with, and experience, their search for goods and services. Thus, it isn’t difficult to see why search engine optimization, or SEO, should be a foundational part of any digital marketing for your real estate investor website. SEO may sound like rocket science, but it isn’t! As we’ve talked about in Part 1 and Part 2 of our online SEO Guide for real estate investors, SEO (or Search Engine Optimization) can be difficult if you aren’t already an expert. That’s why we at LeadPropeller have developed an SEO service where we manage your website’s SEO for you. That way, you’re free to spend your time hunting for motivated seller leads and converting them into deals! SEO involves aligning the design and content of a website to the algorithms that engines like Google use to index and rank sites for value and authority. The more valuable and authoritative search engines determine a site to be, the farther a site moves up in their results pages. But not all SEO is created equal. 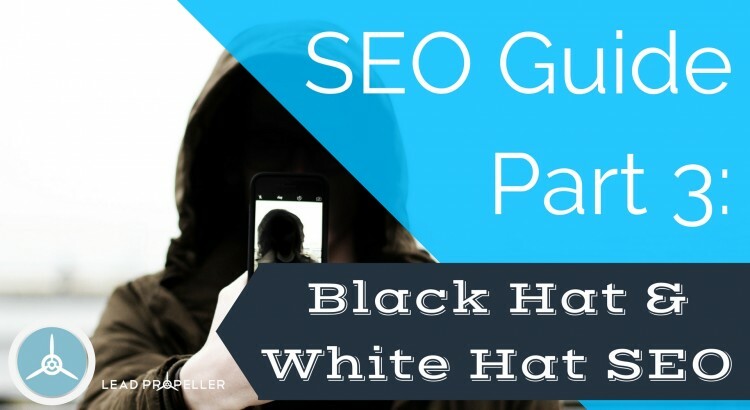 In fact, for those investing in an SEO campaign, knowing the difference between black hat and white hat SEO work could ultimately be the deciding factor in your online marketing campaign’s success. Black hat strategies almost always involve breaking search engine guidelines, which leads to a site being marked as spam, devalued by the engine, and penalized for the use of unethical techniques. Black hat SEO is used by companies who only value immediate results and trade significant long-term Google devaluation of their site for immediate, albeit marginal, signs of growth. These company’s sites are eventually banned from search engine results. Be warned, if you use black hat SEO tactics, you will be penalized one way or another. Black hat SEO gives the illusion of positive ROI, or return on investment, but in reality leads to major losses for websites and will cause loss of search rankings. Link farming is stuffing your pages full of fake links that lead back to your website. Plane and simple, link farming is scamming. What’s worse is, Google will absolutely punish your website for doing this. The algorithm Google uses to determine the ranking of your website is very sophisticated and will find your fake links. Google will then rank your site poorly. You do not want that. If your website ranks badly from using black hat SEO tactics, your potential clients won’t be able to find you online. Have you ever been on a website reading something, or watching a video, and then all of a sudden – BAM – you’re hit with an advertising box that is impossible to click away from? That’s content spam. While this is very common online (yes, even big name websites are known to do content spam) it is still black hat SEO. The main reason website’s use content spam is to get emails and conversions. That seems innocent enough, but when it becomes too much for a viewer, it will cause them to leave your site for a less spammy one. This will badly affect your websites click-through-rate (or CTR), which Google does look at when determining relevancy of a website. Posting lots of copies of the same content all over your website is not in itself a punishable thing to do, but it is risky. Basically, websites that do this are taking some of their content, slapping a new title and description on it, and trying to pass it off as new original content. This is problematic for a website because it no longer will appear relevant and useful for Google. Think of it like inflation. If you fill your site up with lots of the same thing, your website will begin to lose value. You always want your content to stay relevant to the market. If you’re just reposting content from 4 years ago, you run the risk of republishing inaccurate information. We all know what anchor text is. It’s the blue highlighted and underlined words or phrases that, when clicked on, will lead you to another website or web page. Typically, anchor text is relevant to your content, and to the page that it will take a viewer to. For example, earlier in this blog we anchored the phrase “organic traffic” that then brought you to a relevant web page about organic and non-organic traffic for websites. That is a good example of anchor text because it is relevant to our blog about SEO, and is helpful to our readers who might not have known what “organic traffic” is. Using anchor text like that helps Google know what a particular web page is about, and will rank it accordingly. So, if we had used the anchor “organic traffic”, and more anchor texts like that, but had written a blog about cookies, Google’s algorithm would have determined the page irrelevant to searches for cookies. You see, some websites will hide unnatural anchor text to artificially make a page seem like it’s about something that it’s not. Take our cookie page for example. Because the page would have been advertised as being about cookies, stuffing it with links that are anchored “organic traffic” wouldn’t be relevant. That would get our site penalized by Google because the anchor text would have nothing to do with our content. Very similar to hiding unnatural anchor text, posting irrelevant content is just announcing to Google that you’re trying to scam the system. We talked about this in Part 2 of our online SEO Guide with the example about cats. Since this post is about SEO to make your real estate investor website better, having a link to cats in it wouldn’t make sense for the reader. What’s worse is that having a link about cats in blog about SEO would tell Google that we aren’t relevant to our target audience, and would therefore rank our website poorly. Each of these methods will set a site back in the long run, especially in light of Google’s most recent update: Penguin 4.0. As many online marketers have found, the Penguin update now includes more anti-spam detection features than ever before, making it difficult for websites to do well under black hat SEO tactics. White hat SEO, on the other hand, focuses on optimizing a site to provide high-quality content that is relevant and helpful to search queries. These strategies target human audiences in real, intuitive ways and add value to the search experience. While white hat strategies are a long-term solution to site-optimization rather than an overnight fix, they also yield long-term successful results. Think of it this way: black hat SEO is spam, and white hat SEO is real content. People are always going to want to read, and interact with real content more than they’ll want to deal with spam. You always want to be sure your website is full of quality content, not junk. Creating quality content is such an important part of white hat SEO because it displays to search engines that a site has a unique voice to contribute to the online conversation. Ultimately, the more content-rich a site is, the more valuable it is. Backlinko, and online marketing strategy journal, suggests finding your keywords by knowing your niche market. So, as a real estate investor, it wouldn’t make sense for you to use a keyword like “dog”, because that doesn’t have anything to do with your market. Instead, researching the keywords your target audience searches regularly – words like “sell my house fast”, or “we buy houses” – will benefit your business. SERPS, Google’s keyword search tool, is a great place to start research on keywords to use in your website’s content. Additionally, your website will be given a full report on how to better your online marketing strategy. We talked about meta tags in Part 2 of our online SEO Guide, so you already know that meta tags are used to display information about your website in search results. By now you should be familiar with backlinking and interlinking after Part 2 of our online SEO Guide where we talked about user interactions. Backlinking, or inbound links, are links to third party sites that link back to your website. These are important because they show search engines that your content is relevant to your market. Most importantly, though, backlinks are how Google will know that your are a part of your target audience’s queries. Think of it this way: Backlinks are your wingman. Backlinks are there to show viewers that people are talking about you, and that you’re important. They help boost your website’s relevancy, so be sure to use them! Interlinking, or internal links, make your website easily accessible for viewers. Interlinks are links that redirect viewers one one page of your website to another page on your website. For example, in this blog post we’ve already linked back to Part 1 and Part 2 of our online SEO Guide. That way, if a viewer found this page before finding the others, that person now has an avenue to travel through our site and read more of our content. This greatly helps with your website’s CTR, because it redirect viewers to relevant and helpful content and keeps them on your domain longer. Remember, Google takes CTR into account when ranking your website. High quality content is key for keeping viewers coming to, and staying on, your website. High quality content can be anything from a detailed blog (like the one you’re reading), to an infographic, to a tutorial video. As long as the content on your website is helpful in a viewer’s search query, then it is quality content. High quality content will help to improve your website’s CTR, but more importantly is that it will lower the bounce rate of your pages. High bounce rate means that viewers are not staying on your pages for very long, meaning they clearly did not find useful information. But, your bounce rate will go down if your website’s content is relevant to your target audience’s searches. For instance, if your real estate investor website specifically targets people trying to sell their homes quickly, you should have a few posts on your site that talk about the selling process, followed up with a call to action. A call to action is something on a page that is actionable for the viewer. So in your content, you want to make sure to include a link or box that can be clicked on that will bring a viewer to your services. With quality content and call to actions, viewers will leave your page feeling like they learned something, as well as bringing you business. Remember, Google will reward websites that answer a search query, and are useful to the viewer. If your site is using white hat SEO tactics, then it will be useful to your target audience and Google will rank it higher in searches. The extra time required to write provocative articles, develop insightful infographics, and become an expert in your field is worth it. That is the value you bring to the table that will ultimately be rewarded with first page result Google rankings. Don’t Have Time For Doing SEO? At LeadPropeller, we are proud to offer only high-quality, affordable, White Hat SEO content. We only do valuable, ethical work above all else – work that will yield tested, long-term results for our clients and partners. We not only offer free resources to companies seeking to learn more about how to optimize a site, but have a full-scale, done-for-you, “hands-off” SEO service for those looking to immediately start their site’s optimization. Ready to start the journey towards successful white hat SEO? Let LeadPropeller help make your real estate investor website rank higher in your local area!